This post was originally published on Forbes on March 29, 2016. Post written by Jeremy Abbate. Jeremy Abbate is the publisher of Scientific American. 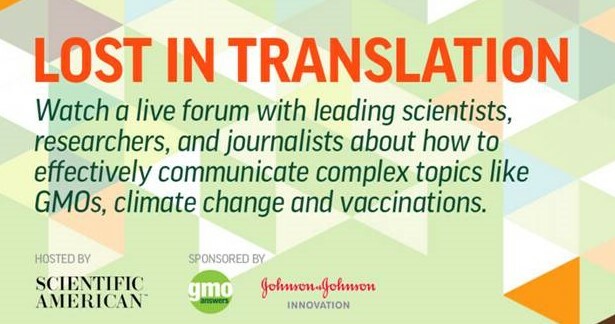 On Thursday, March 31st, Scientific American’s Custom Media Group will host a forum with some of the most highly regarded scientists, policy officials and journalists to examine the challenges that coincide with science journalism. While the irony was self-evident and humorous (he later hung the pair on his wall, with the identical dates highlighted, as a quiet homage to the absurd), the juxtaposition revealed much about the complexities within the ecosystem of science, science journalism and the messages the “informed” public receives. Daunting is the task of a good communicator of science and the burgeoning technological solutions poised to help humanity. To explain complex concepts to a lay or non-specialist public, a journalist must (in addition to many other things) be clear and concise, able to hold the readers’ or viewers’ attention, demonstrate why the topic is of value to understand in the first place, and of course be as accurate as possible. The trickiness of “accuracy” is perfectly underscored by the conflicting headlines about vitamin D intake. As it turns out, even experts can disagree on what constitutes valid proof when it comes to nutrition and supplements. In this case, scientists who insist that the only acceptable standard is the randomized clinical trial, which compares an intervention against a placebo, were likely to find vitamin D levels for most Americans adequate. For other researchers, epidemiological studies, which compared the health of populations who take vitamin D supplements with those who do not, clearly showed a benefit to higher levels of vitamin D.
Of course, even when experts generally agree, and there is broad consensus among the scientific community on an issue, the public may receive mixed or unclear messages. “Balance”, as defined in other kinds of journalism with equal weight given to opposing viewpoints, is a different animal in the world of science. While critics of a policy or research should of course be given a voice, the scientific weight of that voice should be commensurate with the number and credibility of scientists it represents. Indeed, the most important issues of our time (planetary sustainability, human health, equitable access to resources) call for sound science to identify the problems and proffer innovative solutions. The public’s awareness and acceptance of those problems and attendant solutions are in large part dependent on how well they are communicated. Done properly, science journalism should have the happy consequence of building informed consensus around the right causes — ones that help push our society and planet to a more productive, healthier and sustainable place. In a unique and provocative forum from Scientific American’s Custom Media Group coming Thursday, March 31st, and webcast live from the National Press Club, we examine the challenges and complexities in this incredibly important arena, with some of the most highly regarded scientists, policy officials and journalists. Guests include climate scientist James Hansen, NIH’s Anthony Fauci, Marketplace Morning Report’s David Brancaccio, science reporters Keith Kloor, Tamar Haspel and Julia Belluz, and many others. The event will be moderated by John Rennie, former editor in chief, Scientific American. Sponsoring the forum are GMO Answers and Johnson & Johnson Innovation. We are thrilled, as always, to move the conversation of science and technology, and its value to the public forward. Without a clear path toward understanding the complexities of our world and its problems, we will be in no position to adequately evaluate or prioritize the fixes. Indeed, the media has a responsibility to cut through political rhetoric and misinformation to enlighten and engage the public. As science writer Charles Mann recently wrote in the Atlantic, “Bewildered and battered by the back-and-forth, the citizenry sits, for the most part, on its hands.” We hope our forum can improve this state of affairs.